Cured in a marinade of salt and sugar, with the inspired addition of fresh dill creating its distinctive sweet-and-sour flavour. 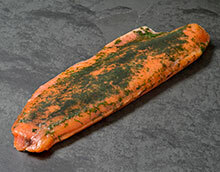 Gravad Lax means ‘buried salmon’, and fishermen traditionally did just that, salting then burying their catch on the beach to preserve it over winter. We replicate this process by carefully wrapping the fish, dry-curing, based on an old Scandinavian recipe using fresh dill rather than dried, and leave under weights, to achieve the appropriate texture. 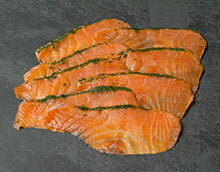 Buy your Gravad Lax online today and experience its unique flavour.